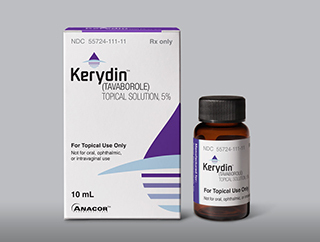 Anacor announced the launch of Kerydin (tavaborole) topical solution, which is being distributed and commercialized by Sandoz. Kerydin is the first oxaborole antifungal approved for the topical treatment of onychomycosis of the toenails. It inhibits protein synthesis by inhibition of an aminoacyl-transfer ribonucleic acid (tRNA) synthetase (AARS). It has been shown to be active against most strains of the following microorganisms, both in vitro and in clinical infections: Trichophyton rubrum and Trichophyton mentagrophytes. Kerydin is available as a 5% topical solution in 10mL and 12mL amber glass bottles with a glass pointed-tip dropper. For more information call (650) 543-7500 or visit Anacor.com.